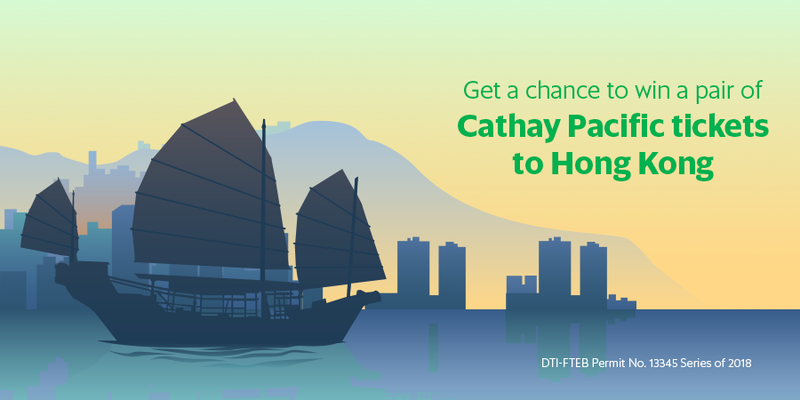 Win a Trip to Hong Kong with Grab and Cathay Pacific! In need of a break? Worry no more! Grab, in partnership with Cathay Pacific, offer Grab riders from Manila, Cebu, and Clark a chance to win round-trip tickets to Hong Kong! Activate your account and receive your Grab code. Register for the raffle by filling out Win a Trip to Hong Kong Registration Form to be eligible for the promo. Earn one (1) raffle entry for every completed ride. Per DTI-FTEB Permit No. 13345 Series of 2018. Promo is valid to all Grab Philippines passengers in Manila, Cebu, Davao and Pampanga. Open the Grab app. Type in your pick up and drop off location. Type in the code you received from the Cathay Pacific Newsletter sign up in the promo code field. Click Book. The code does not provide a discount off a ride – it only acts as an entry into the contest. Entries: One (1) completed ride with promo code is equal to one (1) promo entry. Only those with completed rides with promo code are qualified to the promo. How to Win: Four (4) Grab users who are eligible to win will be selected thru raffle draw. Promo Period: Promo will run from 00:00 on September 3, 2018 (Monday) to 11:59 on October 2, 2018 (Tuesday). Prize: Four (4) winners will win two (2) pairs of round trip economy class airfare tickets to Hong Kong via Cathay Pacific/Cathay Dragon. Point of travel is from Manila, Cebu, Davao or Clark, Pampanga to Hong Kong and from Hong Kong to Manila, Cebu, Davao or Clark, Pampanga. Expenses such hotel accommodation, allowances, prize tax of 20% (applicable to prizes exceeding to PHP10,000) and other fees, if any, as well as any costs incurred in claiming or using the prize shall be shouldered by the winners. Prizes are transferable but not convertible to cash. Determination of Winners: Winners will be determined thru raffle draw. Determination of winners is on October 12, 2018 (Friday), 4:00 PM at the Grab Philippines Head Office at 12/F Wilcon IT Hub, 2251 Chino Roces Ave., Makati City, Philippines. Winners will be notified thru their registered mailing address, mobile number and e-mail address. Announcement of Winners: Winners will be announced on Grab Philippines and Cathay Pacific’s social media account/s on October 17, 2018 (Wednesday) in coordination with DTI representative. Verification of Winners: Winners will be subject to verification by Grab Philippines to authenticate their qualification to win the promo. Delivery of Prize: Prize will be forfeited if unclaimed within 60 days from receipt of registered notice, or if a selected winner otherwise does not comply with the raffle rules with prior DTI approval. Grab Customer Service (CS) team calls the winners and announces the prize to him/her. Grab to send an acknowledgement letter to winners for signature and send it back to Grab for verification. Grab to send a copy of the signed acknowledgment letter to Cathay Pacific. Once flights have been confirmed, winners should send the original signed certificate to CX-Sales Department located at Cathay Pacific Ticket Office 22F LKG Tower, 6801 Ayala Avenue, Makati City for voucher processing. Winners to send back the original signed prize certificate to Cathay Pacific’s Sales Department located at Cathay Pacific Ticket Office 22F LKG Tower, 6801 Ayala Avenue, Makati City. Transfer of Prize: If winner wishes to transfer his prize to another person, he should notify the Grab representative thru e-mail explaining why he wants to transfer his prize. E-mail letter should also include the complete name, address, contact number and e-mail address of the prize recipient together with scanned copy of recipients passport/identification. DTI representative will be invited to check the promo system before the approval of the promo. Travel must be completed within six (6) months from the date of receipt of prize. Complimentary tickets not utilized by this date shall become null and void. The economy class air tickets are valid for return flights from any city Cathay Pacific or Cathay Dragon operates in the Philippines to Hong Kong, in the designated class (O class) only. Travel using the pair of economy class air tickets are valid on Cathay Pacific and Cathay Dragon flights only, and the prize winner and the travel companion must travel together on the entire journey. The air tickets are not be eligible for mileage accrual and cannot be used with redemption of AsiaMiles or any other frequent flyer miles for any upgrade awards. If the flights that the passengers are booked on become critically full, and/or other serious disruptions occur, there is a possibility that passengers will not be accepted for the flight. In this event, passengers will not be offered compensation. Cathay Pacific airport staff will then include the passengers on the booking list for the next available Cathay Pacific flight. Use of the air tickets is subject to seat availability and blackout or embargo periods at the time of reservation or ticket issuance. The aircraft type and schedule is subject to operational changes. The winner is responsible for obtaining and maintaining his/her own necessary visa, travel and any other travel approval(s). Cathay Pacific and its respective directors, employees and assignees, are not liable for any claims arising from the use of prize.